Falconbridge Nickel Mines was incorporated August 28, 1928 as a subsidiary of Ventures Limited. Mining in the Town of Falconbridge, however, can trace its roots back to Thomas Edison. In 1901, Edison staked a 40 acre claim (on the south east quarter of the south half of Lot 12, Concession IV, in Falconbridge, Ontario) in the hopes of finding pure nickel to use in his alkaline storage batteries. Over the next two years, Edison sank a shaft but due to a layer of quicksand stopped just 15 feet prior to reaching a nickel-copper ore deposit. In 1928, Thayer Lindsley created Ventures Limited as a holding company for various other companies and mining claims. Ventures Limited then purchased Falconbridge Mines in August 1928 from the Bennett-Longyear interests for $2,500,000. This was the highest price ever paid at that time for a mine in the Sudbury area. The new company began work immediately on both the mine and creating a new company town for the workers. The shaft was sunk and in 1929 construction began on 25 houses for the approximately 200 miners. Since the International Nickel Company (Inco) owned the rights to refinery technology in North America, Falconbridge purchased a refinery in Kristiansand, Norway. The refinery was renamed Nikkelverk and it provided Falconbridge an opportunity to sell nickel to the European market. The year 1931 marked the first full year of production for Falconbridge Nickel Mines. Despite the depression, the company survived and in 1932 it was able sink a second shaft in Falconbridge and add a precious metals plant in Norway. During World War Two, Falconbridge lost Nikkelverk with the 1940 German occupation of Norway. Inco then provided the refinery services to Falconbridge due to the war effort. Falconbridge regained Nikkelverk in 1945 after the war in Europe ended and renewed operations. During the 1950’s, the company prospered with the rising nickel prices. By 1955, Falconbridge owned five operating mines and four mines under development. On January 31, 1962, Falconbridge merged with its parent company Ventures Limited. Through this merger, Falconbridge gained controlling interests in several large mining companies such as Kiena Gold Mines Limited, Giant Yellowknife Mines Limited (gold), Kilembe Mines Limited (copper), United Keno Hill Mines Limited (silver, lead and zinc) and Lake Default Mines Limited (copper and zinc). During the 1970’s, Superior Oil eventually purchased enough shares to gain control of Falconbridge’s board. The company created Falconbridge International Limited and Falconbridge Europe S.A. to aid with expansion of the company to European clients. By the end of the 1970’s, Falconbridge U.S. Incorporated was created to aid with American marketing of the company. The company, however, suffered an unfavourable economic climate during this decade and in 1977 posted the first loss. This financial upset was quickly offset in 1979 with record earnings. In 1981, Falconbridge Nickel Mines suffered its second financial loss. In an attempt to offset this loss, the company in 1982 ventured to raise capital funds with equity markets. To accomplish this task and to also demonstrate their global diversification in the mining industry, Falconbridge Nickel Mines became Falconbridge Limited. Records were donated by Xstrata Nickel in 2008. The Falconbridge Nickel Mines Limited Department of Health Education records were donated by Ernest Craig's son, Donald Craig in 2015. Fonds consists of photographs and films. Series, file, and item lists are available. To learn more about Thayer Lindsley, see https://www.archeion.ca/lindsley-thayer as well as the Canadian Mining Hall of Fame http://www.mininghalloffame.ca/inductees/j-l/thayer_lindsley. 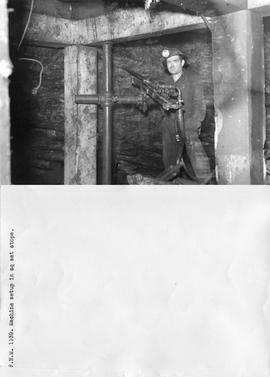 To learn more about Ernest Craig, see https://www.archeion.ca/craig-ernest as well as the Canadian Mining Hall of Fame http://www.mininghalloffame.ca/inductees/a-c/ernest_craig. To learn more about Falconbridge Limited (1982-2006), see https://www.archeion.ca/falconbridge-limited. Sudbury Basin Mines purchased 1,250,000 shares of Falconbridge Nickel Mines in 1928 with $600,000 and 300,000 of its own shares to Ventures Limited as well as an option for Ventures to purchase 200,000 more shares of Sudbury Basin Mines for $10 a share. This transaction insured Ventures Limited control of both Falconbridge and Sudbury Basin Mines. To learn more, see “Falconbridge,” The Canadian Mining Journal, December 14, 1928, p. 1040. On May 2, 2013, Glencore merged with Xstrata to form Glencore Xstrata. On May 20, 2014, Glencore Xstrata became Glencore plc. Xstrata Nickel. The company locally then became known as Glencore’s Sudbury Integrated Nickel Operations (aka Sudbury INO).